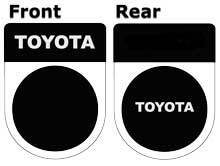 x1 Self adhesive anti theft / tamper proof tax disc holder black text on white with black with white circle to position tax disc. When leaving your car with the hood down your tax disc is vulnerable to theft, this self adhesive sticker prevents the opportunist from quickly stealing your tax disc, a must have option for all soft top cars. 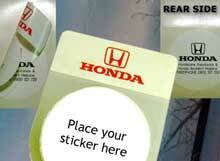 x1 Self adhesive anti theft / tamper proof tax disc holder.